Three years ago I attended a Q&A session with one of the greatest living musical theater composers, Stephen Sondheim. At the time I hadn't seen very many of his shows, but since then I've seen a half dozen more and have really come to appreciate his immense talent. The second installment of the Ordway's wonderfully entertaining and informative Broadway Songbook series this season features the words and music of Sondheim. James Rocco (the Ordway's Artistic Director) once again wrote and hosts the show, sharing stories about Sondheim's life and work. He whittled Sondheim's 19 Broadway musicals down to select songs from 11 of these shows (the Sondheim catalog is so great that perhaps Sondheim should be an annual occurrence in this series!). Joining James onstage are musical director Raymond Berg, who very ably leads us through this challenging music, and six of my favorite local musical theater actors: Jennifer Baldwin Peden, Dieter Bierbrauer*, Joel Liestman, Kersten Rodau, Erin Schwab, and Regina Marie Williams. Saturday Night (1954, not produced until 1997): Jennifer Baldwin Peden sings a lovely ode to NYC in the first musical that Sondheim wrote, although it wasn't seen on Broadway until over 40 years later. West Side Story (1957, lyrics only): This is one of the greats and one of my favorite musicals. In perhaps the most thrilling moment of the show, the entire cast sings the brilliant "Tonight Quintet," with Dieter reprising his role as Tony (which he played at the Chanhassen several years ago) and Jennifer hitting those piercing high notes as Maria, while the others prepare for the rumble. Dieter also sings another great song from the show, "Something's Coming." Gypsy (1959, lyrics): Kersten and Jennifer duet as Louise and June on the adorable "If Momma Was Married," while Regina channels Mama Rose in "Some People." Anyone Can Whistle (1964): Kersten lends her powerful voice to a really amazing song I've never heard before, "There Won't Be Trumpets," and Erin sings the heart-breaking title song. Company (1970): Once again reprising a role he previously played (in Theater Latte Da's gorgeous production just last fall), Dieter sings one of the best musical theater songs, "Being Alive." It's the third time I've heard him sing it, and it just gets better every time! In another classic from the show, Erin hilariously and effectively belts out "Ladies Who Lunch." I'll drink to that! Follies (1971): So many great musical theater classics in this show I was lucky enough to see on Broadway a few years ago, including "Broadway Baby," "I'm Still Here," and "Buddy's Blues." But perhaps my favorite is a song that was cut from the show, the very funny and clever "Can That Boy Fox Trot," perfectly delivered by Jennifer. A Little Night Music (1973): This show gave us one of the most famous Sondheim songs, "Send in the Clowns," which Regina sings with beautiful and heartfelt emotion. Sweeney Todd (1979): Joel sings a lovely rendition of my favorite song from this otherwise dark and creepy show, "Not While I'm Around." Into the Woods (1987): Joel and Dieter are the two princes in "Agony," complaining about the difficulty of winning their princesses' love. And the show closes with the touching "No One Is Alone" and "Children Will Listen," with the voices of the entire cast blending beautifully. The Frogs (1974/2004): The show very appropriately opens with a selection from this previously unknown-to-me musical. Road Show (2008): Regina and Dieter sing a charming duet from this frequently re-worked show, "The Best Thing That Ever Happened To Me." 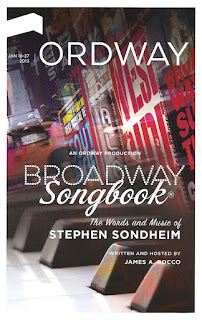 The Ordway's Broadway Songbook series is a great thing for musical theater lovers like myself. A chance to hear familiar songs and a few new ones, and take a deep dive into a particular artist's work. James is a welcome host; his enthusiasm for the material is contagious. And the performers are always among the best Minneapolis and St. Paul have to offer. This is the fourth one that I've seen (I've only missed one since its inception), and every one has been so much fun. I hope they continue the series for years to come! Broadway Songbook: The Words and Music of Stephen Sondheim continues this weekend. If you love musical theater, you don't want to miss this one! Next up: Cole Porter, where they're sure to do a few numbers from Anything Goes, also coming to the Ordway this spring. *I met Dieter a few weeks ago when I spotted him at the Pantages Theatre for a performance of Aida. I'm happy to report that in addition to being a talented singer/actor, he's also a lovely person. He said that his mom often reads Cherry and Spoon and tells him about it, so hello and thank you Mrs. Bierbrauer!